Sam and Hadley West are both trying to survive a shared, unthinkable loss. For Sam, a sports journalist, acceptance means an arduous trek by dogsled across the Alaskan wilderness. For Hadley, it means renting a benignly haunted, salt-soaked cottage off the Maine coast, where she begins to paint again. 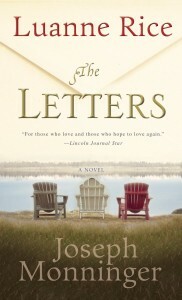 Waiting for their divorce to be finalized, they begin to exchange letters, filled with longing and truths they’ve never before voiced, as they recall their marriage—its magic moments and its challenges—and rediscover the reason they fell in love in the first place.